Willful prevention of communicating relevant information involving the commission of a crime. Delaying the conveyance of information relative to a crime from an investigating officer. Preventing anyone with a valuable information about a crime to communicate it to the authorities. The investigating officer to whom the communication is withheld must be authorized by his department in conducting the investigation. Officers of a financial institution who notify a client whose records issubject to an investigation or relaying the content of the subpoena and the information that was provided in response to the subpoena. Intent to delay or obstruct any judicial proceedings. 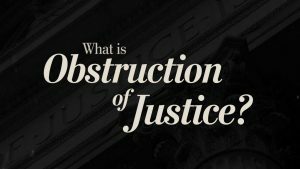 Obstruction of justice is usually committed against a criminal investigator/s, judges, prosecutors, attorney generals, elective officers and such other persons who are involved in criminal investigations authorized by their department or agencies. The investigating bodies whose investigations were delayed or affected can file charges against you for obstruction of justice under 18 USC § 1510. Any officer of a financial institution who will notify a customer regarding any information related to the subpoena issued againstthe person or whose record is being investigated. Imprisonment of not more than 5 years or a fine or both may be imposed. Long-term prison sentence can sometimes be avoided in white collar crimes, such as in Obstruction pursuant to18 USC 1510. White Collar Prison Consultants specializes in helping federal and state offenders to obtain sentence reductions through programs that can help provide alternative solutions to long term incarceration. Our consultation services employ investigative and research processes to assist inmates and their lawyers in finding the best solution and alternatives available to reduce prison terms of an inmate. Discuss possible solutions to your issues today.